Blackinton B954 5-Point Star Badge with Panel - B954 - 1 7/16" x 1 3/8"
Home > Blackinton > Police Badges > Star Badges > B954 5-Point Star Badge with Panel - B954 - 1 7/16" x 1 3/8"
B954 5-Point Star Badge with Panel - B954 - 1 7/16" x 1 3/8"
Blackinton B954 is an attractive badge with two panels. Each of the five points is decoratively etched with a ball at the tip. You may include information of your rank and department with three lines of text on the panels and affix a seal of your choice to the center. 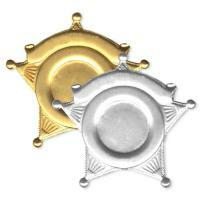 This shield measuring 1 7/16" x 1 3/8" is available in either gold or silver cast metal. It is of the fine quality for which Blackinton has become famous. You will have this sturdy badge for many years to come and wear it proudly knowing that it was manufactured with pride right here in the United States of America. Please allow four to six weeks for customization and delivery. 5-Point Star Badge with Panel - B954 - 1 7/16" x 1 3/8"
Badge with Eagle and Applied Panels - B741 - 2" x 3"
Badge with Eagle and Batons - B627-HA - 2 1/4" x 2 11/16"
5-Point Star Badge with Ring - BH1976 - 2 1/4" x 2 1/4"
5-Point Star Badge with Panel - B959 - 1 7/8" x 1 13/16"
6-Point Star with Applied Panel - B862 - 1 5/8" x 1 7/8"
6-Point Star Badge with Panel - B817 - 2 3/4" x 3 1/8"
7-Point Star Badge with Panel - B748 - 2 1/8" x 2 1/16"
6-Point Star Badge with Panel - B650-D - 2 1/4" x 2 1/2"
5 Point Star with Balled Tip - BH1974-B - 2 5/8" x 2 5/8"
6-Point Star Badge - B650 - 2 1/4" x 2 1/2"
©2002-2019 CopsPlus.com: Blackinton B954 5-Point Star Badge with Panel - B954 - 1 7/16" x 1 3/8"